Our straitjackets make Great HALLOWEEN Costumes!!! 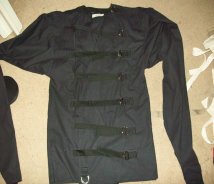 Our Costume Jackets are very basic yet still excellent quality. Only available in natural color (white shown)We offer these for people who want to dress up in a straitjacket costume or use for photography. We still use the highest quality fabric, but we don't use the normal amount of stitching or reinforcing. These are the best costume straitjackets on the market for the price. One of our most popular items. This is the essential addition to the Hannibal Lecter costume. It looks good and can turn the straitjacket into a real horror show. The perfect accessory for any straitjacket. This is one of my favorites and is completely unique, no one else will have anything like this. This one is made to the normal quality standards, so is durable and will hold up to use. Mask not included. -Give your jacket the authentic touch. For more info on any of our options or add-ons please the pictures.